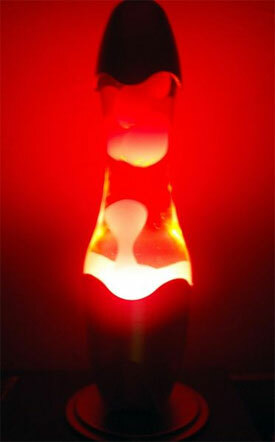 The Lava Lamp is an outstanding icon of the 60s and 70s! Stoned or straight, one could sit for hours watching the slow motion bubbles from the bottom of the Lava Lamp. They rise slowly, sometimes breaking into pieces, sometimes merging with others. Once at the top, they sit for a while and then slowly sink to the bottom to start again. Edward Walker invented the Lava Lamp based on a lamp that he spotted in a pub. He brought his new invention, called the “Astro Lamp” or Astro Light” to a Hamburg trade show in 1965 where Adolph Wertheimer noticed it and bought the American rights to the product and began to produce it as the “Lava Lite”. The construction is fairly simple, a glass bottle filled with a clear liquid and a colored wax, sitting on a base with a light bulb. As the bulb heats the wax on the bottom, it expands, becomes lighter than the liquid, and rises. As it cools, it contracts, becomes heavier, and sinks. Once it warms up, there’s a continual flow of wax “blobs” rising and falling. Lava Lamps have gone mainstream and are still made and available in department stores, and there is usually one on the shelf at the Goodwill Store. Their construction has changed some over the years as some of the original materials have been replaced with safer ones, but they still work the same and I still love to watch them. HOW IT ALL STARTED…The first motion lamp was designed in 1963 by an engineer, Edward Craven Walker, who sold it under the name Astro Lamp. In 1965, two American entrepreneurs saw the lamp displayed at a German trade show and were in awe of its beauty. They secured the rights to manufacture the lamp in North America. The Astro Lamp was introduced to the United States, renamed the LAVA® brand motion lamp and production moved to Chicago. From whimsy to fame, LAVA® brand motion lamps stay cool generation after generation. To this day, Haggerty Enterprises, Inc. is the only manufacturer of the LAVA® brand motion lamp.LAVA® brand motion lamps through the years… The original and most popular model in the 60’s & 70’s was the “CenturyTM,” which is still manufactured today. This model has a large gold base with tiny holes to simulate starlight and a 52oz globe with white or red blobs floating in yellow or blue liquid. Today, this classic lamp is just as popular as it ever was.The CenturyTM LAVA® brand motion lamp is the one that started it all. This is the original design created by Edward Craven Walker, which he sold as the Astro Lamp. The Aristocrat LAVA® brand motion lamp with its perforated base gives a starlit appearance; it is especially dramatic in dimly lit areas. A delightful model for use in homes, offices and businesses.The Princess LAVA® brand motion lamp A dramatic new styling concept. Use singly in halls or foyer, in pairs for smart new wall treatments. The Consort LAVA® brand motion lamp was designed with a “Masculine flavor… perfect for the study or den, so right for the executive suite.” Now, we can not take credit for this copy. This is right out of our 1970’s catalog. The Nite Lite LAVA® brand motion lamp Soft diffused light to complement the soothing, sleep-provoking action. The thoughtful touch for a child’s bedroom or nursery. The Empress LAVA® brand motion lamp Regal beauty to reflect the charm and warmth of one’s personal good taste.The Regency LAVA® brand motion lamp Tall, stately, elegant. A modern decorator touch for reception or waiting rooms, the perfect conversation piece for library or den.Aladdin LAVA® brand motion lampRub the base and make three wishes. Well, not really, but the Aladdin Lava® brand motion lamp was quite the novelty. The Mediterranean LAVA® brand motion lamp was inspired by exotic Spain with its superbly scrolled jet-black wrought iron.LAVA® brand Coach Lantern Authentic reproduction of Old English Coach Light finished and cast in gleaming copper finish aluminum. It captures the elegance and mood of old world England and modern Americana. The Enchantress Planter LAVA® brand motion lamp came with a planter “blooming with delicate (plastic) foliage and exquisite floral greenery.” Very romantic!LAVA® brand GemliteTM motion lamp – The Mystique Model Square, simple, sophisticated, contemporary design in a square, brushed-aluminum base with matching cap.LAVA® brand GemliteTM motion lamp – The Continental Model Stylized oval-shaped, brushed-aluminum base with matching top.Capri LAVA® brand motion lamp in brushed-brass or chrome finish with matching cap now in a contemporary, modern design that accents this magical LAVA® brand motion lamp with its mystical, undulating action.Aztec LAVA® brand motion lamp “New for the 80’s.”Carlisle LAVA® brand motion lamp Sophistication with simplicity, beauty without blandness. Satin brass finish base accented with perforations that give starlike appearance.